"Homeless" redirects here. For other uses, see Homeless (disambiguation). Homelessness is defined as living in housing that is below the minimum standard or lacks secure tenure. People can be categorized as homeless if they are: living on the streets (primary homelessness); moving between temporary shelters, including houses of friends, family and emergency accommodation (secondary homelessness); living in private boarding houses without a private bathroom and/or security of tenure (tertiary homelessness). The legal definition of homeless varies from country to country, or among different jurisdictions in the same country or region. According to the UK homelessness charity Crisis, a home is not just a physical space: it also provides roots, identity, security, a sense of belonging and a place of emotional wellbeing. United States government homeless enumeration studies also include people who sleep in a public or private place not designed for use as a regular sleeping accommodation for human beings. People who are homeless are most often unable to acquire and maintain regular, safe, secure and adequate housing due to a lack of, or an unsteady income. Homelessness and poverty are interrelated. In 2005, an estimated 100 million (1 in 65 at the time) people worldwide were homeless and as many as 1 billion people live as squatters, refugees or in temporary shelter, all lacking adequate housing. In Western countries, the majority of homeless are men (50–80%), with single males particularly overrepresented. However, current data suggests similar rates of homeless males and females. In 2015, the United States reported that there were 564,708 homeless people within its borders, one of the higher reported figures worldwide. These figures are likely underestimates as surveillance for the homeless population is challenging. When compared to the general population, people who are homeless experience higher rates of adverse physical and mental health outcomes, which renders them vulnerable to health conditions associated with climate change. Chronic disease severity, respiratory conditions, rates of mental health illnesses and substance use are all often greater in homeless populations than the general population. Homelessness is also associated with a high risk of suicide attempts. People experiencing homelessness have limited access to resources and are often disengaged from health services, making them that much more susceptible to extreme weather events (e.g., extreme cold or heat) and ozone levels. These disparities often result in increased morbidity and mortality in the homeless population. There are a number of organizations who provide help for the homeless. Most countries provide a variety of services to assist homeless people. These services often provide food, shelter (beds) and clothing and may be organized and run by community organizations (often with the help of volunteers) or by government departments or agencies. These programs may be supported by the government, charities, churches and individual donors. Many cities also have street newspapers, which are publications designed to provide employment opportunity to homeless people. While some homeless have jobs, some must seek other methods to make a living. Begging or panhandling is one option, but is becoming increasingly illegal in many cities. People who are homeless may have additional conditions, such as physical or mental health issues or substance addiction; these issues make resolving homelessness a challenging policy issue. Homeless people, and homeless organizations, are sometimes accused or convicted of fraudulent behaviour. Criminals are also known to exploit homeless people, ranging from identity theft to tax and welfare scams. These incidents often lead to negative connotations on the homeless as a group. In 2004, the United Nations sector of Economic and Social Affairs defined a homeless household as those households without a shelter that would fall within the scope of living quarters due to a lack of or a steady income. They carry their few possessions with them, sleeping in the streets, in doorways or on piers, or in another space, on a more or less random basis. (b) Secondary homelessness. This category may include persons with no place of usual residence who move frequently between various types of accommodations (including dwellings, shelters, and institutions for the homeless or other living quarters). This category includes persons living in private dwellings but reporting 'no usual address' on their census form. The CES acknowledges that the above approach does not provide a full definition of the 'homeless'. Homelessness is perceived and addressed differently according to country. The European Typology of Homelessness and Housing Exclusion (ETHOS) was developed as a means of improving understanding and measurement of homelessness in Europe, and to provide a common "language" for transnational exchanges on homelessness. The ETHOS approach confirms that homelessness is a process (rather than a static phenomenon) that affects many vulnerable households at different points in their lives. The typology was launched in 2005 and is used for different purposes: as a framework for debate, for data collection purposes, for policy purposes, monitoring purposes, and in the media. This typology is an open exercise which makes abstraction of existing legal definitions in the EU member states. It exists in 25 language versions, the translations being provided mainly by volunteer translators. The terms unsheltered and unhoused refer to that segment of a homeless community who do not have ordinary lawful access to buildings in which to sleep; the latter term is defined by the United States Department of Housing and Urban Development (HUD) as describing persons occupying "place not designed for ... sleeping accommodation for human beings". Such persons frequently prefer the term houseless to the term homeless. Recent homeless enumeration survey documentation utilizes the term unsheltered homeless. The common colloquial term street people does not fully encompass all unsheltered people, in that many such persons do not spend their time in urban street environments. Many shun such locales, because homeless people in urban environments may face the risk of being robbed or beaten up. Some people convert unoccupied or abandoned buildings ("squatting"), or inhabit mountainous areas or, more often, lowland meadows, creek banks and beaches. Many jurisdictions have developed programs to provide short-term emergency shelter during particularly cold spells, often in churches or other institutional properties. These are referred to as warming centers, and are credited by their advocates as lifesaving. HUD requires jurisdictions which participate in Continuum of Care grant programs to count their homeless every two years. These counts have led to a variety of creative measures to avoid undercounting. Thus teams of counters, often numbering in the hundreds in logistically complex volunteer efforts, seek out the unsheltered in various nooks and crannies. These counts include people sleeping in official shelters and people sleeping in parks, alleys and other outdoor locations. Following the Peasants' Revolt, English constables were authorised under 1383 English Poor Laws statute to collar vagabonds and force them to show support; if they could not, the penalty was gaol. Vagabonds could be sentenced to the stocks for three days and nights; in 1530, whipping was added. The presumption was that vagabonds were unlicensed beggars. In 1547, a bill was passed that subjected vagrants to some of the more extreme provisions of the criminal law, namely two years servitude and branding with a "V" as the penalty for the first offense and death for the second. Large numbers of vagabonds were among the convicts transported to the American colonies in the 18th century. During the 16th century in England, the state first tried to give housing to vagrants instead of punishing them, by introducing bridewells to take vagrants and train them for a profession. In the 17th and 18th centuries, these were replaced by workhouses but these were intended to discourage too much reliance on state help. 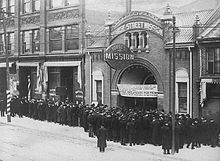 The growing movement toward social concern sparked the development of rescue missions, such as the U.S. first rescue mission, the New York City Rescue Mission, founded in 1872 by Jerry and Maria McAuley. In smaller towns, there were hobos, who temporarily lived near train tracks and hopped onto trains to various destinations. Especially following the American Civil War, a large number of homeless men formed part of a counterculture known as "hobohemia" all over the United States. This phenomenon re-surged in the 1930s during and after the Great Depression. How the Other Half Lives and Jack London's The People of the Abyss (1903) discussed homelessness, and raised public awareness, which caused some changes in building codes and some social conditions. In England, dormitory housing called "spikes" was provided by local boroughs. By the 1930s in England, there were 30,000 people living in these facilities. In 1933, George Orwell wrote about poverty in London and Paris, in his book Down and Out in Paris and London. In general, in most countries, many towns and cities had an area which contained the poor, transients, and afflicted, such as a "skid row". In New York City, for example, there was an area known as "the Bowery", traditionally, where alcoholics were to be found sleeping on the streets, bottle in hand. The Great Depression of the 1930s caused a devastating epidemic of poverty, hunger, and homelessness. There were two million homeless people migrating across the United States. Many lived in shantytowns they called "Hoovervilles". In the 1960s, the nature and growing problem of homelessness changed in England as public concern grew. The number of people living "rough" in the streets had increased dramatically. However, beginning with the Conservative administration's Rough Sleeper Initiative, the number of people sleeping rough in London fell dramatically. This initiative was supported further by the incoming Labour administration from 2009 onwards with the publication of the 'Coming in from the Cold' strategy published by the Rough Sleepers Unit, which proposed and delivered a massive increase in the number of hostel bed spaces in the capital and an increase in funding for street outreach teams, who work with rough sleepers to enable them to access services. Modern homelessness started as a result of economic stresses in society and reductions in the availability of affordable housing such as single room occupancies (SROs) for poorer people. In the United States, in the 1970s, the deinstitutionalisation of patients from state psychiatric hospitals was a precipitating factor that seeded the homeless population, especially in large cities like New York City. This theory is vigorously disputed by clinical psychologist Seth Farber who points out that "the emptying of the state mental hospitals took place almost entirely in the 1960s and 1970s," a decade or more before the steep rise in homelessness which began in the late 1980s. Some[who?] feel that Ronald Reagan's signing (as governor of California in 1967) of the Lanterman–Petris–Short Act greatly exacerbated homelessness among the mentally ill. This law lowered the standards for involuntary commitment in civil courtrooms and was followed by significant de-funding of 1700 hospitals caring for mental patients [unclear why lowering standards would cause less committals]. The Community Mental Health Act of 1963 was a predisposing factor in setting the stage for homelessness in the United States. Long-term psychiatric patients were released from state hospitals into SROs and supposed to be sent to community mental health centers for treatment and follow-up, but it never quite worked out properly. The community mental health centers mostly did not materialize, and this population largely was found living in the streets soon thereafter with no sustainable support system. Also, as real estate prices and neighborhood pressure increased to move these people out of their areas, the SROs diminished in number, putting most of their residents in the streets. Other populations were mixed in later, such as people losing their homes for economic reasons, those with addictions, the elderly, and others. Trends in homelessness are closely tied to neighborhood conditions, according to a report by the Edna McConnell Clark Foundation in 1990. In 2002, research showed that children and families were the largest growing segment of the homeless population in the United States, and this has presented new challenges, especially in services, to agencies. Some trends involving the plight of homeless people have provoked some thought, reflection and debate. One such phenomenon is paid physical advertising, colloquially known as "sandwich board men". Another trend is the side-effect of unpaid free advertising of companies and organizations on shirts, clothing, and bags, to be worn by homeless and poor people, given out and donated by companies to homeless shelters and charitable organizations for otherwise altruistic purposes. These trends are reminiscent of the "sandwich board signs" carried by poor people in the time of Charles Dickens in the Victorian 19th century in England and later during the Great Depression in the United States in the 1930s. In the US, the government asked many major cities to come up with a ten-year plan to end homelessness. One of the results of this was a "Housing first" solution; rather than to have a homeless person remain in an emergency homeless shelter it was thought to be better to quickly get the person permanent housing of some sort and the necessary support services to sustain a new home. But there are many complications of this kind of program which must be dealt with to make such an initiative work successfully in the middle to long term. Some formerly homeless people, who were finally able to obtain housing and other assets which helped to return to a normal lifestyle, have donated money and volunteer services to the organizations that provided aid to them during their homelessness. Alternatively, some social service entities that help homeless people now employ formerly homeless individuals to assist in the care process. Homelessness has migrated toward rural and suburban areas. The number of homeless people has not changed dramatically but the number of homeless families has increased according to a report of HUD. The United States Congress appropriated $25 million in the McKinney-Vento Homeless Assistance Grants for 2008 to show the effectiveness of Rapid Re-housing programs in reducing family homelessness. In February 2009, President Obama signed the American Recovery and Reinvestment Act of 2009, part of which addressed homelessness prevention, allocating $1.5 billion for a Homeless Prevention Fund. The Emergency Shelter Grant (ESG) program's name was changed to Emergency Solution Grant (ESG) program, and funds were re-allocated to assist with homeless prevention and rapid re-housing for families and individuals. On 20 May 2009, President Obama signed the Homeless Emergency Assistance and Rapid Transition to Housing (HEARTH) Act into Public Law (Public Law 111-22 or "PL 111-22"), reauthorizing HUD's Homeless Assistance programs. It was part of the Helping Families Save Their Homes Act of 2009. The HEARTH act allowed for the prevention of homelessness, rapid re-housing, consolidation of housing programs, and new homeless categories. In the eighteen months after the bill's signing, HUD was to make regulations implementing this new McKinney program. The HEARTH Act also codified in law the Continuum of Care planning process, long a part of HUD's application process to assist homeless persons by providing greater coordination in responding to their needs. This final rule integrated the regulation of the definition of homeless and the corresponding record-keeping requirements, for the Shelter Plus Care program and the Supportive Housing Program. This final rule also established the regulation for the definition developmental disability and the definition and record-keeping requirements for homeless individual with a disability for the Shelter Plus Care program and the Supportive Housing Program. In late 2009, some homeless advocacy organizations, such as the National Coalition for the Homeless, reported and published perceived problems with the HEARTH Act of 2009 as a HUD McKinney-Vento Reauthorization bill, especially with regard to privacy, definitional ineligibility, community roles, and restrictions on eligible activities. Forced eviction. In many countries, people lose their homes by government orders to make way for newer upscale high rise buildings, roadways, and other governmental needs. The compensation may be minimal, in which case the former occupants cannot find appropriate new housing and become homeless. Foreclosures on landlords often lead to eviction of their tenants. "The Sarasota, Florida, Herald Tribune noted that, by some estimates, more than 311,000 tenants nationwide have been evicted from homes this year after lenders took over the properties." Living with a mental disorder, where mental health services are unavailable or difficult to access. A United States federal survey done in 2005 indicated that at least one-third of homeless men and women have serious psychiatric disorders or problems. Autism spectrum disorders and schizophrenia are the top two common mental disabilities among the U.S. homeless. Personality disorders are also very prevalent, especially Cluster A . Mortgage foreclosures where mortgage holders see the best solution to a loan default is to take and sell the house to pay off the debt. The popular press made an issue of this in 2008. Traumatic brain injury, a condition which, according to a Canadian survey, is widespread among homeless people and, for around 70% of respondents, can be attributed to a time "before the onset of homelessness"
A substantial percentage of the US homeless population are individuals who are chronically unemployed or have difficulty managing their lives effectively due to prolonged and severe drug and/or alcohol abuse. Substance abuse can cause homelessness from behavioral patterns associated with addiction that alienate an addicted individual's family and friends who could otherwise provide support during difficult economic times. Increased wealth disparity and income inequality causes distortions in the housing market that push rent burdens higher, making housing unaffordable. Dr. Paul Koegel of RAND Corporation, a seminal researcher in first-generation homelessness studies and beyond, divided the causes of homelessness into structural aspects and then individual vulnerabilities. There is sometimes corruption and theft by the employees of a shelter, as evidenced by a 2011 investigative report by FOX 25 TV in Boston wherein a number of Boston public shelter employees were found stealing large amounts of food over a period of time from the shelter's kitchen for their private use and catering. The homeless are often obliged to adopt various strategies of self-presentation in order to maintain a sense of dignity, which constrains their interaction with passers-by and leads to suspicion and stigmatization by the mainstream public. Homelessness is also a risk factor for depression caused by prejudice (i.e. "deprejudice"). When someone is prejudiced against people who are homeless and then becomes homeless themselves, their anti-homelessness prejudice turns inward, causing depression. "Mental disorders, physical disability, homelessness, and having a sexually transmitted infection are all stigmatized statuses someone can gain despite having negative stereotypes about those groups." Difficulties can compound exponentially. For example, a homeless man in New Jersey found that he could not get food from some volunteer organizations if he did not have a legally-recognized address; after being mugged, he lost valuable identification documents and contact information so he could not contact his daughter; since his hips and knee had been broken because of the attack, it was harder for him after recovering in the hospital to walk to those places which did offer free food; in numerous instances, problems seemed to exacerbate other problems in a downward cycle. A study found that in the city of Hong Kong over half of the homeless population in the city (56%) suffered from some degree of mental illness. Only 13% of the 56% were receiving treatment for their condition leaving a huge portion of homeless untreated for their mental illness. The homeless are often the victims of violent crime. A 2007 study found that the rate of violent crimes against the homeless in the United States is increasing. In the United States in 2013 there were 109 reported attacks on homeless people, an increase of 24 per cent on the previous year, according to the National Coalition for the Homeless. Eighteen of those attacked died as a result. In July 2014 three boys 15, 16 and 18, were arrested and charged with beating to death two homeless men with bricks and a metal pole in Albuquerque. The 18-year-old was subsequently found guilty of second-degree murder and other felony charges and sentenced to 67 years in prison, the 16-year old was sentenced to 26 years in prison. A study of women veterans found that homelessness is associated with domestic violence, both directly as the result of leaving an abusive partner, and indirectly due to trauma, mental health conditions, and substance abuse. Rent-controlled apartments contribute to shelter and street populations (around .04%). Apartments that are rent-controlled encourage people to not move out or to pass apartments along between families; this leads to higher rents for new renters, and reduces availability and affordability. About 10% of housing in the United States is under price control laws. Most of the laws were enacted to deal with the high inflation rates experienced during the 1970s and 80s. These laws can motivate apartment owners to convert their property to a more profitable enterprise, thereby reducing the amount of housing available to potential tenants. A black market can also develop, with tenants leasing rent-controlled premises at prices above the legal maximum. This can price out lower income individuals and families. Prior to 1983, the term 'homeless' implied that economic conditions caused homelessness. However, after 1983, conditions such as alcoholism and mental illness also became associated with the term in the media. Claims were often backed up with testimony made by high-ranking officials. For example, Ronald Reagan stated that "one problem that we’ve had, even in the best of times, is the people who are sleeping on the grates, those who are homeless by choice.". This claim made homelessness into a personal choice and a state of mind, and unhinged it from the neoliberal reforms sweeping through the economic system. In the broader sense, it made homelessness something that would exist even under the best economic conditions, and therefore independent of economic policies and economic conditions. Due to the stigma attached to the term, consequences have arisen. Fear is a major consequence. Many people fear the homeless due to the stigma surrounding the homeless community. Surveys have revealed that before spending time with the homeless, most people fear them, but after spending time with the homeless, that fear is lessened or is no longer there. Another effect of this stereotype is isolation. Homeless people often experience isolation. This gives the homeless community no say in how things are. No one really listens to them. Most countries provide a variety of services to assist homeless people. Provisions of food, shelter and clothing and may be organized and run by community organizations, often with the help of volunteers, or by government departments. Assistance programs may be supported by government, charities, churches and individual donors. In 1998, a study by Koegel and Schoeni of a homeless population in Los Angeles, California, reported that a significant number of homeless do not participate in government assistance programs, and the authors reported being puzzled as to why that was, with the only possible suggestion from the evidence being that transaction costs were perhaps too high. The United States Department of Housing and Urban Development and Veterans Administration have a special Section 8 housing voucher program called VASH (Veterans Administration Supported Housing), or HUD-VASH, which gives out a certain number of Section 8 subsidized housing vouchers to eligible homeless and otherwise vulnerable US armed forces veterans. The HUD-VASH program has shown success in housing many homeless veterans. Non-governmental organizations also house and/or redirect homeless veterans to care facilities. Social Security Income/Social Security Disability Income, Access, Outreach, Recovery Program (SOAR) is a national project funded by the Substance Abuse and Mental Health Services Administration. It is designed to increase access to SSI/SSDI for eligible adults who are homeless or at risk of becoming homeless and have a mental illness and/or a co-occurring substance use disorder. Using a three-pronged approach of Strategic Planning, Training, and Technical Assistance (TA), the SOAR TA Center coordinates this effort at the state and community level. While some homeless people are known to have a community with one another, providing each other various types of support, people who are not homeless also may provide them friendship, food, relational care, and other forms of assistance. Such social supports may occur through a formal process, such as under the auspices of a non-governmental organization, religious organization, or homeless ministry, or may be done on an individual basis. In Los Angeles, a collaboration between the Ostrow School of Dentistry of the University of Southern California and the Union Rescue Mission shelter offer homeless people in the Skid Row area free dental services. Many non-profit organizations such as Goodwill Industries "provide skill development and work opportunities to people with barriers to employment", though most of these organizations are not primarily geared toward homeless individuals. Many cities also have street newspapers or magazines: publications designed to provide employment opportunity to homeless people or others in need by street sale. While some homeless have paying jobs, some must seek other methods to make money. Begging or panhandling is one option, but is becoming increasingly illegal in many cities. Despite the stereotype, not all homeless people panhandle, and not all panhandlers are homeless. Another option is busking: performing tricks, playing music, drawing on the sidewalk, or offering some other form of entertainment in exchange for donations. In cities where plasmapheresis (blood donation) centers still exist, homeless people may generate income through visits to these centers. Homeless people can also provide waste management services to earn money. Some homeless people find returnable bottles and cans and bring them to recycling centres to earn money. For example, they can sort out organic trash from other trash, and/or separate out trash made of the same material (for example, different types of plastics, and different types of metal). Especially in Brazil, many people are already engaged in such activities. In addition, rather than sorting waste at landfills, ... they can also collect litter found on/beside the road to earn an income. Homeless people have been known to commit crimes just to be sent to jail or prison for food and shelter. Invented in 2005, in Seattle, Bumvertising, an informal system of hiring homeless people to advertise, has provided food, money, and bottles of water to sign-holding homeless in the Northwest. Homeless advocates have accused its founder, Ben Rogovy, and the process, of exploiting the poor and take particular offense to the use of the word "bum" which is generally considered pejorative. In October 2009, The Boston Globe carried a story on so-called cyberbegging, or Internet begging, which was reported to be a new trend worldwide. The United States Department of Labor has sought to address one of the main causes of homelessness, a lack of meaningful and sustainable employment, through targeted training programs and increased access to employment opportunities that can help homeless people develop sustainable lifestyles. This has included the development of the United States Interagency Council on Homelessness, which addresses homelessness on the federal level in addition to connecting homeless individuals to resources at the state level. All individuals who are in need of assistance are able, in theory, to access employment and training services under the Workforce Investment Act (WIA), although this is contingent upon funding and program support by the government, with veterans also being able to use the Veterans Workforce Investment Program. Under the Department of Labor, the Veterans' Employment and Training Service (VETS) offers a variety of programs targeted at ending homelessness among veterans. The Homeless Veterans' Reintegration Program (HVRP) is the only national program that is exclusively focused on assisting veterans as they reenter the workforce. The VETS program also has an Incarcerated Veterans' Transition Program, as well as services that are unique to female Veterans. Mainstream programs initiated by the Department of Labor have included the Workforce Investment Act, One-Stop Career Centers, and a Community Voice Mail system that helps to connect homeless individuals around the United States with local resources. Targeted labor programs have included the Homeless Veterans' Reintegration Project, the Disability Program Navigator Initiative, efforts to end chronic homelessness through providing employment and housing projects, Job Corps, and the Veterans Workforce Investment Program (VWIP). Street newspapers are newspapers or magazines sold by homeless or poor individuals and produced mainly to support these populations. Most such newspapers primarily provide coverage about homelessness and poverty-related issues, and seek to strengthen social networks within homeless communities, making them a tool for allowing homeless individuals to work. 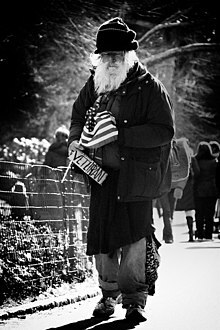 In New York City in 1989, a street newspaper was created called Street News which put some homeless to work assisting with writing, producing, and mostly selling the paper on streets and trains. Street News was written pro bono by a combination of homeless, celebrities, and established writers. In 1991, in England, a street newspaper following the New York model was established, called The Big Issue which is published weekly. Its circulation has grown to 300,000. Chicago has StreetWise which has the second largest circulation of its kind in the United States, 30,000. Boston has a Spare Change News newspaper, founded in 1992 by a small group of homeless people in Boston, built on the same model as the others: homeless helping themselves. San Francisco has the twice-monthly Street Sheet newspaper, founded in 1989, with a distribution of 32,000 per month. In central and southern Florida, The Homeless Voice works to spread awareness of homelessness and provide aid to victims through its street paper. The publication is the oldest continuously published street newspaper, operates advertising-free, contains poverty-related news stories, artwork, and poetry, and is provided to street vendors free of charge. Seattle has Real Change, a $1 newsletter that aims to directly benefit homeless people and also report on economic issues in the area. Portland, Oregon, has Street Roots with articles and poetry by homeless writers, sold on the street for a dollar. Street Sense in Washington, D.C., has gained popularity and helped many make the move out of homelessness. Students in Baltimore, Maryland, have opened a satellite office for that paper as well.The Challenger Street Newspaper is written and run by people experiencing homelessness and their allies in Austin, Texas – one of the most economically segregated cities in America. Sacramento, California, has Homeward Street Journal, published bimonthly with a circulation of about 11,000 per issue. Many housing initiatives involve homeless people in the process of building and maintaining affordable shared housing. This process works as a double impact by not only providing housing but also giving homeless people employment income and work experience. One example of this type of initiative is the nonprofit organization Living Solutions, located in downtown San Diego, CA. This community initiative provides the homeless population with a source of housing as well as giving them jobs building affordable homes. The initiative builds community empowerment by asking formerly homeless residents to help to maintain and repair the homes. Residents are responsible for all household duties, including menu planning, budgeting, shopping, cooking, cleaning, yard work, and home maintenance. The environment of responsibility over a living space fosters a sense of ownership as well as involvement in all parts of the decision-making process. Homeless shelters can become grounds for community organization and the recruitment of homeless individuals into social movements for their own cause. Cooperation between the shelter and an elected representative from the homeless community at each shelter can serve as the backbone of this type of initiative. The representative presents and forwards problems, raises concerns and provides new ideas to the director and staff of the shelters. Examples of possible problems are ways to deal with drug and alcohol use by certain shelter users, and resolution of interpersonal conflicts. SAND, the Danish National Organization for Homeless People, is one example of an organization that uses this empowerment approach. Issues reported at the homeless shelters are then addressed by SAND at the regional or national level. To open further dialogue, SAND organizes regional discussion forums where staff and leaders from the shelters, homeless representatives, and local authorities meet to discuss issues and good practices at the shelters. Los Angeles conducted a competition promoted by Mayor Eric Garcetti soliciting ideas from developers to use bond money more efficiently in building housing for the city's homeless population. The top five winners were announced on Feb. 1, 2019 and the concepts included using assembly-ready molded polymer panels that can be put together with basic tools, prefabricated 5-story stack-able houses, erecting privately financed modular buildings on properties that do not require City Council approval, using bond money to convert residential garages into small apartments which are then dedicated to homeless rentals, and the redeveloping of Bungalow-court units, the small low-income iconic buildings that housed 7% of the city's population in the 1920s. In the neighborhood of Westlake, Los Angeles, the city is funding the first transitionally homeless housing building using “Cargotecture,” or "architecture built from repurposed shipping containers." The Hope on Alvarado micro-apartment building will consist of 4-stories of 84 containers stacked together like Lego bricks on top of a traditionally constructed ground floor. Completion is anticipated by the end of 2019. Voting for elected officials is important for the homeless population to have a voice in the democratic process. Equal access to the right to vote is a crucial part of maintaining a democracy. Voting enables homeless people to play a part in deciding the direction of their communities on local, regional and national issues that are important and relevant to their lives. Unfortunately, in some jurisdictions it may be hard for homeless people to vote if they do not have identification, a fixed address, or a place to receive mail. With each election, low income and homeless individuals vote at a lower rate than those with higher incomes, despite the fact that many policy decisions directly impact people who are economically disadvantaged. Currently, issues such as raising the minimum wage and funding certain social welfare and housing programs are being debated in the U.S. Congress and in communities around the country. In order for the government to represent the people, citizens must vote — especially those who are economically disadvantaged. A model of how to overcome obstacles and encourage greater voter participation among low-income and homeless citizens was provided by the National Coalition for the Homeless and other national advocacy and grassroots social movement groups. These groups collaborated to create a manual that promotes voting access for low income and homeless persons, to ensure that those who are economically disadvantaged maintain an active role in shaping their futures. The manual is designed to cultivate ideas to help overcome the many obstacles that prevent people experiencing homelessness from becoming registered, active voters. By working together with homeless persons, low-income individuals, and advocates around the country, grassroots social movement organizations can help ensure their voices heard on Election Day. In 1979 a New York City lawyer, Robert Hayes, brought a class-action suit, Callahan v. Carey, against the City and State, arguing for a person's constitutional "right to shelter". It was settled as a consent decree in August 1981. The City and State agreed to provide board and shelter to all homeless men who met the need standard for welfare or who were homeless by certain other standards. By 1983 this right was extended to homeless women. By the mid-1980s, there was a dramatic increase in family homelessness. Tied into this was an increasing number of impoverished and runaway children, teenagers, and young adults, which created a new substratum of the homeless population (street children or street youth). Also in the 1980s, in the United States, some federal legislation was introduced on homelessness as a result of the work of Congressman Stewart B. McKinney. In 1987, the McKinney-Vento Homeless Assistance Act was enacted. There are many community organizations and social movements around the world which are taking action to reduce homelessness. They have sought to counteract the causes and reduce the consequences by starting initiatives that help homeless people transition to self-sufficiency. Social movements and initiatives tend to follow a grassroots, community-based model of organization – generally characterized by a loose, informal and decentralized structure, with an emphasis on radical protest politics. By contrast, an interest group aims to influence government policies by relying on more of a formal organization structure. These groups share a common element: they are both made up of and run by a mix of allies of the homeless population and former or current members of the homeless population. Both grassroots groups and interest groups aim to break stereotyped images of the homeless as being weak and hapless, or defiant criminals and drug addicts, and to ensure that the voice of homeless people and their representatives is clearly heard by policymakers. Homeless shelters are most often night shelters, where people leave in the morning to do whatever they can manage and return in the evening when the beds in the shelter open up again for sleeping. An example of a homeless shelter is Pine Street Inn in Boston's South End neighborhood. There are some daytime shelters where people might go instead of being stranded on the street, and to receive meals, counseling, avail themselves of resources, and otherwise spend their day until returning to their overnight sleeping arrangements. An example of such a day center shelter model is Saint Francis House in Boston, founded in the early 1980s, which is open to the homeless all year long during daytime hours and was originally based on the settlement house model. Many homeless people keep all their possessions with them because they have no access to storage. There have been "bag" people, shopping cart people, and soda can collectors (known as binners or dumpster divers) who sort through garbage to find items to sell, trade, or eat. Such people have typically carried all their possessions with them all the time. If they had no access to or ability to get to a shelter and possible bathing, or access to toilets and laundry facilities, their hygiene was lacking. This has created social tensions in public places. These conditions have created an upsurge in tuberculosis and other diseases in urban areas. In 1974, Kip Tiernan founded Rosie's Place in Boston, the first drop-in and emergency shelter for women in the United States, in response to the increasing numbers of needy women throughout the country. 24-hour Internet cafes are now used by over 5,000 Japanese "Net cafe refugees". An estimated 75% of Japan's 3,200 all-night internet cafes cater to regular overnight guests, who in some cases have become their main source of income. 24-hour McDonald's restaurants are used by "McRefugees" in Japan, China and Hong Kong. There are about 250 McRefugees in Hong Kong. Homeless shelters: including emergency cold-weather shelters opened by churches or community agencies, which may consist of cots in a heated warehouse, or temporary Christmas Shelters. More elaborate homeless shelters such as Pinellas Hope in Florida provide residents with a recreation tent, a dining tent, laundry facilities, outdoor tents, casitas, and shuttle services that help inhabitants get to their jobs each day. Inexpensive boarding houses: have also been called flophouses. They offer cheap, low-quality temporary lodging. Inexpensive motels offer cheap, low-quality temporary lodging. However, some who can afford housing live in a motel by choice. For example, David and Jean Davidson spent 22 years at a UK Travelodge. Public places: Parks, bus or train stations, public libraries, airports, public transportation vehicles (by continual riding where unlimited passes are available), hospital lobbies or waiting areas, college campuses, and 24-hour businesses such as coffee shops. Many public places use security guards or police to prevent people from loitering or sleeping at these locations for a variety of reasons, including image, safety, and comfort of patrons. Shantytowns: ad hoc dwelling sites of improvised shelters and shacks, usually near rail yards, interstates and high transportation veins. Some shantytowns have interstitial tenting areas, but the predominant feature consists of hard structures. Each pad or site tends to accumulate roofing, sheathing, plywood, and nailed two by fours. Single room occupancy (more commonly abbreviated to SRO) is a form of housing that is typically aimed at residents with low or minimal incomes who rent small, furnished single rooms with a bed, chair, and sometimes a small desk. SRO units are rented out as permanent residence and/or primary residence  to individuals, within a multi-tenant building where tenants share a kitchen, toilets or bathrooms. SRO units range from 80 to 140 square feet. In the 2010s, some SRO units may have a small refrigerator, microwave and sink. (also called a "residential hotel"). Squatting in an unoccupied structure where a homeless person may live without payment and without the owner's knowledge or permission. Tent cities: ad hoc campsites of tents and improvised shelters consisting of tarpaulins and blankets, often near industrial and institutionally zoned real estate such as rail yards, highways and high transportation veins. A few more elaborate tent cities, such as Dignity Village, are hybrids of tent cities and shantytowns. Tent cities frequently consist only of tents and fabric improvised structures, with no semi-permanent structures at all. Tiny houses and micro-shelters: small, inexpensive homes known as “tiny houses” or “micro-shelters” have been increasingly used as alternative housing for the homeless in certain cities. On the high end, these dwellings can include utilities and furnishings (tiny houses); on the lower end they can be simply a covered structure large enough to accommodate a sleeping area (micro-shelters). Some of the micro-shelters popping up in cities around the world include wheels for easy transport and can be relocated by manually pushing; tiny houses usually require towing by a vehicle. Several cities have designated areas where tiny houses and micro-shelters can be located. Nonprofit organizations and sole individuals construct and donate these structures for the homeless. Outdoors: on the ground or in a sleeping bag, tent, or improvised shelter, such as a large cardboard box, under a bridge, in an urban doorway, in a park or a vacant lot. Underground tunnels such as abandoned subway, maintenance, or train tunnels are popular among the long-term or permanent homeless. Vehicles: cars or trucks used as temporary or sometimes long-term living quarters, for example by those recently evicted from a home. Some people live in recreational vehicles (RVs), school buses, vans, sport utility vehicles, covered pick-up trucks, station wagons, sedans, or hatchbacks. The vehicular homeless, according to homeless advocates and researchers, comprise the fastest-growing segment of the homeless population. Many cities have safe parking programs in which lawful sites are permitted at churches or in other out-of-the-way locations. For example, because it is illegal to park on the street in Santa Barbara, the New Beginnings Counseling Center worked with the city to make designated parking lots available to the homeless. The inhabitants of such refuges are called in some places, like New York City, "Mole People". Natural caves beneath urban centers allow for places where people can congregate. Leaking water pipes, electric wires, and steam pipes allow for some of the essentials of living. Transitional housing provides temporary housing for the certain segments of the homeless population, including the working homeless, and is meant to transition residents into permanent, affordable housing. This is usually a room or apartment in a residence with support services. The transitional time can be relatively short, for example, one or two years, and in that time the person must file for and obtain permanent housing along with gainful employment or income, even if Social Security or assistance. Sometimes transitional housing programs charge a room and board fee, maybe 30% of an individual's income, which is sometimes partially or fully refunded after the person procures a permanent residence. In the U.S., federal funding for transitional housing programs was originally allocated in the McKinney–Vento Homeless Assistance Act of 1986. Foyers are a specific type of Transitional Housing designed for homeless or at-risk teens. Foyers are generally institutions that provide affordable accommodation as well as support and training services for residents. They were pioneered in the 1990s in the United Kingdom, but have been adopted in areas in Australia and the United States as well. Supportive housing is a combination of housing and services intended as a cost-effective way to help people live more stable, productive lives. Supportive housing works well for those who face the most complex challenges — individuals and families confronted with homelessness who also have very low incomes and/or serious, persistent issues such as substance abuse, addictions, alcoholism, mental illness, HIV/AIDS, or other serious challenges. In 2007, urban designer and social theorist Michael E. Arth proposed a controversial national solution for homelessness involving the building of nearly car-free "Pedestrian Villages" in place of what he terms "the current band-aid approach to the problem." A prototype, Tiger Bay Village, was proposed for near Daytona Beach, FL. He claimed this would be superior for treating the psychological and psychiatric needs of both temporarily and permanently homeless adults, and would cost less. It would provide a lower cost alternative to jail, and provide a half-way station for those getting out of prison. Work opportunities, including construction and maintenance of the villages, as well as the creation of workforce agencies would help make the villages financially and socially viable. In South Australia, the state government of Premier Mike Rann (2002-2011) committed substantial funding to a series of initiatives designed to combat homelessness. Advised by Social Inclusion Commissioner David Cappo and the founder of New York's Common Ground program, Rosanne Haggerty, the Rann government established Common Ground Adelaide, building high-quality inner city apartments (combined with intensive support) for "rough sleeping" homeless people. The government also funded the Street to Home program and a hospital liaison service designed to assist homeless people admitted to the emergency departments of Adelaide's major public hospitals. Rather than being released back into homelessness, patients identified as rough sleepers were found accommodation backed by professional support. Common Ground and Street to Home now operate across Australia in other States. In 2013, a Central Florida Commission on Homelessness study indicated that the region spends $31,000 a year per homeless person to cover "salaries of law enforcement officers to arrest and transport homeless individuals — largely for nonviolent offenses such as trespassing, public intoxication or sleeping in parks — as well as the cost of jail stays, emergency room visits and hospitalization for medical and psychiatric issues. This did not include "money spent by nonprofit agencies to feed, clothe and sometimes shelter these individuals". In contrast, the report estimated the cost of permanent supportive housing at "$10,051 per person per year" and concluded that "[h]ousing even half of the region's chronically homeless population would save taxpayers $149 million over the next decade — even allowing for 10 percent to end up back on the streets again." This particular study followed 107 long-term-homeless residents living in Orange, Osceola or Seminole Counties. There are similar studies showing large financial savings in Charlotte and Southeastern Colorado from focusing on simply housing the homeless." James Brown, student nurse at Jacksonville University School of Nursing takes the blood pressure of a homeless veteran during the annual Stand Down for Homelessness activity in Savannah, Georgia. Health care for homeless people is a major public health challenge. Homeless people are more likely to suffer injuries and medical problems from their lifestyle on the street, which includes poor nutrition, exposure to the severe elements of weather, and a higher exposure to violence. Yet at the same time, they have reduced access to public medical services or clinics, in part because they often lack identification or registration for public healthcare services. There are significant challenges in treating homeless people who have psychiatric disorders because clinical appointments may not be kept, their continuing whereabouts are unknown, their medicines may not be taken as prescribed, medical and psychiatric histories are not accurate, and other reasons. Because many homeless people have mental illnesses, this has presented a crisis in care. Homeless people may find it difficult to document their date of birth or their address. Because homeless people usually have no place to store possessions, they often lose their belongings, including identification and other documents, or find them destroyed by police or others. Without a photo ID, homeless persons cannot get a job or access many social services, including healthcare. They can be denied access to even the most basic assistance: clothing closets, food pantries, certain public benefits, and in some cases, emergency shelters. Obtaining replacement identification is difficult. Without an address, birth certificates cannot be mailed. Fees may be cost-prohibitive for impoverished persons. And some states will not issue birth certificates unless the person has photo identification, creating a Catch-22. This problem is far less acute in countries which provide free-at-use health care, such as the UK, where hospitals are open-access day and night and make no charges for treatment. In the U.S., free-care clinics for homeless and other people, do exist in major cities, but often attract more demand than they can meet. The conditions affecting homeless people are somewhat specialized and have opened a new area of medicine tailored to this population. Skin conditions, including scabies, are common because homeless people are exposed to extreme cold in the winter and have little access to bathing facilities. They have problems caring for their feet and have more severe dental problems than the general population. Diabetes, especially untreated, is widespread in the homeless population. Specialized medical textbooks have been written to address this for providers. There are many organizations providing free care to homeless people in countries which do not offer free state-run medical treatment, but the services are in great demand given the limited number of medical practitioners. For example, it might take months to get a minimal dental appointment in a free-care clinic. Communicable diseases are of great concern, especially tuberculosis, which spreads more easily in crowded homeless shelters in high-density urban settings. There has been ongoing concern and studies about the health and wellness of the older homeless population, typically ages 50 to 64, and older, as to whether they are significantly more sickly than their younger counterparts and if they are under-served. In 1985, the Boston Health Care for the Homeless Program was founded to assist the growing numbers of homeless living on the streets and in shelters in Boston and who were suffering from lack of effective medical services. In 2004, Boston Health Care for the Homeless in conjunction with the National Health Care for the Homeless Council published a medical manual called "The Health Care of Homeless Persons", edited by James J. O'Connell, M.D., specifically for the treatment of the homeless population. In June 2008 in Boston, the Jean Yawkey Place, a four-story, 77,653-square-foot (7,214.2 m2) building, was opened by the Boston Health Care for the Homeless Program. It is an entire full-service building on the Boston Medical Center campus dedicated to providing healthcare for homeless people. It also contains a long-term care facility, the Barbara McInnis House, which expanded to 104 beds, and is the first and largest medical respite program for homeless people in the United States. A 2011 study led by Dr. Rebecca T. Brown in Boston, conducted by the Institute for Aging Research (an affiliate of Harvard Medical School), Beth Israel Deaconess Medical Center, and the Boston Health Care for the Homeless Program found the elderly homeless population had "higher rates of geriatric syndromes, including functional decline, falls, frailty and depression than seniors in the general population and that many of these conditions may be easily treated if detected". The report was published in the Journal of Geriatric Internal Medicine. There are government avenues which provide resources for the development of healthcare for the homeless. In the United States, the Bureau of Primary Health Care has a program which provides grants to fund the delivery of healthcare to the homeless. According to 2011 UDS data community health centers were able to provide service to 1,087,431 homeless individuals. There are also many nonprofit and religious organizations which provide healthcare services to the homeless. These organizations help meet the large need which exists for expanding healthcare for the homeless. The 2010 passage of the Patient Protection and Affordable Care Act could provide new healthcare options for the homeless in the United States, particularly through the optional expansion of Medicaid. A 2013 Yale study indicated that a substantial proportion of the chronically homeless population in America would be able to obtain Medicaid coverage if states expanded Medicaid under the Affordable Care Act. There have been significant numbers of unsheltered persons dying of hypothermia, adding impetus to the trend of establishing warming centers as well as extending enumeration surveys with vulnerability indexes. A review article on foot and skin care of the homeless showed foot fungus as the most common ailment of the homeless, while one study showed 7% of the homeless tested positive for syphilis. Most surprising was that no single case of biopsy-proven melanoma had been reported among the homeless. In 1999, Dr. Susan Barrow of the Columbia University Center for Homelessness Prevention Studies reported in a study that the "age-adjusted death rates of homeless men and women were four times those of the general U.S. population and two to three times those of the general population of New York City". A report commissioned by homeless charity Crisis in 2011 found that on average, homeless people in the UK have a life expectancy of 47 years, 30 years younger than the rest of the population. Homeless persons have increased vulnerability to extreme weather events for many reasons. They are disadvantaged in most social determinants of health, including lack of housing and access to adequate food and water, reduced access to health care and difficulty in maintaining health care. They have significantly higher rates of chronic disease including respiratory disease and infections, gastrointestinal disease, musculoskeletal problems and mental health disease. In fact, self-reported rates of respiratory diseases (including asthma, chronic bronchitis and emphysema) are double that of the general population. The homeless population often live in higher risk urban areas with increased exposure and little protection from the elements. They also have limited access to clean drinking water and other methods of cooling down. The built environment in urban areas also contributes to the “heat island effect”, the phenomenon whereby cities experience higher temperatures due to the predominance of dark, paved surfaces and lack of vegetation. Homeless populations are often excluded from disaster planning efforts, further increasing their vulnerability when these events occur. Without the means to escape extreme temperatures and seek proper shelter and cooling or warming resources, homeless people are often left to suffer the brunt of the extreme weather. The health effects that result from extreme weather include exacerbation of chronic diseases and acute illnesses. Pre-existing conditions can be greatly exacerbated by extreme heat and cold, including cardiovascular, respiratory, skin and renal disease, often resulting in higher morbidity and mortality during extreme weather. Acute conditions such as sunburn, dehydration, heat stroke and allergic reactions are also common. In addition, a rise in insect bites can lead to vector-borne infections. Mental health conditions can also be impacted by extreme weather events as a result of lack of sleep, increased alcohol consumption, reduced access to resources and reduced ability to adjust to the environmental changes. In fact, pre-existing psychiatric illness has been shown to triple the risk of death from extreme heat. Overall, extreme weather events appear to have a “magnifying effect” in exacerbating the underlying prevalent mental and physical health conditions of homeless populations. In 2005, Hurricane Katrina, a category 5 hurricane, made landfall on Florida and Louisiana. It particularly affected the city of New Orleans and the surrounding areas. Hurricane Katrina was the deadliest hurricane in the US in seven decades with more than 1,600 confirmed deaths and more than 1,000 people missing. The hurricane disproportionately affected marginalized individuals and individuals with lower socioeconomic status (i.e., 93% of shelter residents were African–American, 32% had household incomes below $10,000/year and 54% were uninsured). The storm nearly doubled the number of homeless people in New Orleans. While in most cities the homeless people account for 1% of the population, in New Orleans’ the homeless account for 4% of the population. In addition to its devastating effects on infrastructure and the economy, the estimated prevalence of mental illness and the incidence of West Nile Virus more than doubled after Hurricane Katrina in the hurricane-affected regions. Thus, natural disasters can not only lead thousands into homelessness, but also contribute to exacerbating adverse health effects for this vulnerable population. 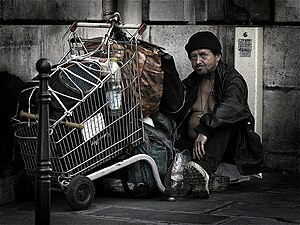 In western countries such as the United States, the typical homeless person is male and single, with the Netherlands reporting 80% of homeless people aged 18–65 to be men. Some cities have particularly high percentages of males in homeless populations, with men comprising eighty-five percent of the homeless in Dublin. Non-white people are also overrepresented in homeless populations, with such groups two and one-half times more likely to be homeless in the U.S. The median age of homeless people is approximately 35. In 2005, an estimated 100 million people worldwide were homeless. The following statistics indicate the approximate average number of homeless people at any one time. Each country has a different approach to counting homeless people, and estimates of homelessness made by different organizations vary wildly, so comparisons should be made with caution. United States: According to HUD's July 2010 5th Homeless Assessment Report to Congress, in a single night in January 2010, single-point analysis reported to HUD showed 649,917 people experiencing homelessness. This number had increased from January 2009's 643,067. The unsheltered count increased by 2.8 percent while the sheltered count remained the same. Also, HUD reported the number of chronically homeless people (persons with severe disabilities and long homeless histories) decreased one percent between 2009 and 2010, from 110,917 to 109,812. Since 2007 this number had decreased by 11 percent. This was mostly due to the expansion of permanent supportive housing programs. The change in numbers has occurred due to the prevalence of homelessness in local communities rather than other changes. According to HUD's July 2010 Homeless Assessment Report to Congress, more than 1.59 million people spent at least one night in an emergency shelter or transitional housing program during the 2010 reporting period, a 2.2 percent increase from 2009. Most users of homeless shelters used only an emergency shelter, while 17 percent used only transitional housing, and less than 5 percent used both during the reporting period. Since 2007, the annual number of those using homeless shelters in cities has decreased from 1.22 million to 1.02 million, a 17 percent decrease. The number of persons using homeless shelters in suburban and rural areas increased 57 percent, from 367,000 to 576,000. In the U.S., the federal government's HUD agency has required federally-funded organizations to use a computer tracking system for homeless people and their statistics, called HMIS (Homeless Management Information System). There has been some opposition to this kind of tracking by privacy advocacy groups, such as EPIC. However, HUD considers its reporting techniques to be reasonably accurate for homeless in shelters and programs in its Annual Homeless Assessment Report to Congress. Actually determining and counting the number of homeless is very difficult in general due to their lifestyle habits. There are so-called "hidden homeless" out of sight of the normal population and perhaps staying on private property. Various countries, states, and cities have come up with differing means and techniques to calculate an approximate count. For example, a one night "homeless census count", called a point-in-time (PIT) count, usually held in early winter for the year, is a technique used by a number of American cities, such as Boston. Los Angeles uses a mixed set of techniques for counting, including the PIT street count. In 2003, The United States Department of Housing and Urban Development (HUD) had begun requiring a PIT count in all "Continuum of Care" communities which required them to report a count of people, housing status, and geographic locations of individuals counted. Some communities provide sub-population information to the PIT, such as information on veterans, youth, and elderly individuals, as done in Boston. Japan: 20,000–100,000 (some figures put it at 200,000–400,000). Reports show that homelessness is on the rise in Japan since the mid-1990s. There are more homeless men than homeless women in Japan because it is usually easier for women to get a job and they are less isolated than men. Also Japanese families usually provide more support for women than they do for men. The number of homeless people worldwide has grown steadily in recent years. In some developing countries such as Nigeria and South Africa, homelessness is rampant, with millions of children living and working on the streets. Homelessness has become a problem in the countries of China, India, Thailand, Indonesia, and the Philippines despite their growing prosperity, mainly due to migrant workers who have trouble finding permanent homes. Determining the true number of homeless people worldwide varies between 100 million and 1 billion people based on the exact definition used. Refugees, asylum-seekers, and internally displaced persons (ITDs) can also be considered homeless in that they too experience "marginalization, minority status, socio-economic disadvantage, poor physical health, collapse of social supports, psychological distress, and difficulty adapting to host cultures" like the domestic homeless. This new perspective on homelessness sheds light on the plight of refugees, a population of stateless people who are not normally included in the mainstream definition of homelessness. It has also created problems for researchers because the nature of "counting" homeless people across the globe relies heavily on who is considered a homeless person. Homeless individuals, and by extension refugees, can be seen as lacking lack the "crucible of our modern society" and lacking a way of actively belonging to and engaging with their respective communities or cultures  As Casavant demonstrates, a spectrum of definitions for homelessness, called the "continuum of homelessness," should refer to refugees as homeless individuals because they not only lose their home, but they are also afflicted with a myriad of problems that parallel those affecting the domestic homeless, such as "[a lack of] stable, safe and healthy housing, an extremely low income, adverse discrimination in access to services, with problems of mental health, alcohol, and drug abuse or social disorganization"  Refugees, like the domestic homeless, lose their source of identity and way of connecting with their culture for an indefinite period of time. For people in Russia, especially the youth, alcoholism and substance abuse is a major cause and reason for becoming and continuing to be homeless. The United Nations, United Nations Centre for Human Settlements (UN-Habitat) wrote in its Global Report on Human Settlements in 1995: "Homelessness is a problem in developed as well as in developing countries. In London, for example, life expectancy among homeless people is more than 25 years lower than the national average." Poor urban housing conditions are a global problem, but conditions are worst in developing countries. Habitat says that today 600 million people live in life- and health-threatening homes in Asia, Africa, and Latin America. For example, more than three in four young people had insufficient means of shelter and sanitation in some African countries like Malawi. "The threat of mass homelessness is greatest in those regions because that is where population is growing fastest. By 2015, the 10 largest cities in the world will be in Asia, Latin America, and Africa. Nine of them will be in developing countries: Mumbai, India – 27.4 million; Lagos, Nigeria – 24.4; Shanghai, China – 23.4; Jakarta, Indonesia – 21.2; São Paulo, Brazil – 20.8; Karachi, Pakistan – 20.6; Beijing, China – 19.4; Dhaka, Bangladesh – 19; Mexico City, Mexico – 18.8. The only city in a developed country that will be in the top ten is Tokyo, Japan – 28.7 million." In 2008, Dr. Anna Tibaijuka, Executive Director of UN-HABITAT, referring to the recent report "State of the World's Cities Report 2008/2009", said that the world economic crisis we are in should be viewed as a "housing finance crisis" in which the poorest of poor were left to fend for themselves. In Australia the Supported Accommodation Assistance Program (SAAP) is a joint Commonwealth and state government program which provides funding for more than 1,200 organisations which are aimed to assist homeless people or those in danger of becoming homeless, as well as women and children escaping domestic violence. They provide accommodation such as refuges, shelters, and half-way houses, and offer a range of supported services. The Commonwealth has assigned over $800 million between 2000 and 2005 for the continuation of SAAP. The current program, governed by the Supported Assistance Act 1994, specifies that "the overall aim of SAAP is to provide transitional supported accommodation and related support services, in order to help people who are homeless to achieve the maximum possible degree of self-reliance and independence. This legislation has been established to help the homeless people of the nation and help rebuild the lives of those in need. The cooperation of the states also helps enhance the meaning of the legislation and demonstrates their desire to improve the nation as best they can." In 2011, the Specialist Homelessness Services (SHS) program replaced the SAAP program. In the United States, the number of homeless people grew in the 1980s, as welfare cuts increased. Housing First is an initiative to help homeless people reintegrate into society, and out of homeless shelters. It was initiated by the federal government's Interagency Council on Homelessness. It asks cities to come up with a plan to end chronic homelessness. In this direction, there is the belief that if homeless people are given independent housing to start, with some proper social supports, then there would be no need for emergency homeless shelters, which it considers a good outcome. However this is a controversial position. Miami, Florida's Community Partnership for Homeless launched a national outreach program in 2008 to help other communities throughout the United States address homelessness. Since its inception in 1993, CPH has served nearly 76,000 residents with a successful outplacement rate of nearly 62 percent in Miami-Dade County, Florida. The number of homeless people in the county has declined by 83 percent. The national program shares CPH's model of Homeless Assistance Centers, job training programs, on-site childcare, housing assistance and more. The organization also provides background on its unique funding structure and partnerships within the community. Homelessness has increased rapidly in the past decade. Domestic violence, substance abuse, losing jobs, unaffordable rent and issues with family are significant contributing factors. In the Bowery, homelessness used to be common, but has declined since the 1970s. The area began revitalization in the 1990s and now is an upscale Manhattan neighborhood. Carrfour Supportive Housing, a nonprofit organization established in 1993 by the Homeless Committee of the Greater Miami Chamber of Commerce – develops, operates and manages innovative housing communities for individuals and families in need through a unique approach combining affordable housing with comprehensive, on-site supportive services. As the leading not-for-profit provider of supportive housing in Florida, Carrfour has supplied homes for more than 10,000 formerly homeless men, women and children since its founding. In Philadelphia, Pennsylvania, in 2007, a non-profit organization named Back on My Feet was created by runner Anne Mahlum as a running club for homeless men and women in the area, to help overcome homelessness through a multi-step self-help program centered on running three days a week, plus sponsored running events. Participants, drawn from local homeless shelters partnered with the organization, are assigned to different teams within each chapter and monitored by a nonresident member, and are required to commit to punctuality, endurance, self-optimism, team spirit, and sobriety. The members earn incentives through continued participation and progress, culminating in educational scholarships and assistance in finding permanent housing and employment. Back on My Feet counted a total of 400 homeless runners in nine cities after five years, and by the beginning of 2013 counted 10 different city chapters in the United States, with four more chapters planned by the end of the year. In Boston, Massachusetts, in September 2007, an outreach to homeless people was established in the Boston Common, after some arrests and shootings, and in anticipation of the cold winter ahead. This outreach targets homeless people who would normally spend their sleeping time on the Boston Common, and tries to get them into housing, trying to skip the step of an emergency shelter. Applications for Boston Housing Authority were being handed out and filled out and submitted. This is an attempt to enact by outreach the Housing First initiative, federally mandated. Boston's Mayor, Thomas Menino, was quoted as saying "The solution to homelessness is permanent housing". Still, this is a very controversial strategy, especially if the people are not able to sustain a house with a proper community, health, substance counseling, and mental health supportive programs. In October 2009, as part of the city's Leading the Way initiative, Mayor Thomas M. Menino of Boston dedicated and opened the Weintraub Day Center which is the first city-operated day center for chronically homeless persons. It is a multi-service center, providing shelter, counseling, healthcare, housing assistance, and other support services. It is a 3,400-square-foot (320 m2) facility located in the Woods Mullen Shelter. It is also meant to reduce the strain on the city's hospital emergency rooms by providing services and identifying health problems before they escalate into emergencies. It was funded by $3 million in grants from the American Recovery and Reinvestment Act of 2009, Massachusetts Department of Housing and Community Development (DHCD), the Massachusetts Medical Society and Alliance Charitable Foundation, and the United States Department of Health and Human Services Substance Abuse and Mental Health Services Administration (SAMHSA). In 2010 in New York City, where there were over 36,000 homeless people in 2009, there was a mobile video exhibit in the streets showing a homeless person on a screen and asking onlookers and passersby to text with their cellphones a message for him, and they also could donate money by cellphones to the organization Pathways to Housing. In September 2010, it was reported that the Housing First Initiative had significantly reduced the chronic homeless single person population in Boston, Massachusetts, although homeless families were still increasing in number. Some shelters were reducing the number of beds due to lowered numbers of homeless, and some emergency shelter facilities were closing, especially the emergency Boston Night Center. In 2011, the Department of Veterans Affairs Supportive Services for Veterans Families Initiative, SSVF, began funding private non-profit organizations and consumer cooperatives to provide supportive services to very low-income veteran families living in or transitioning to permanent housing. In 2019, in an interview with CBS News, scholar Sara Goldrick-Rab said that her study on college student homelessness found that "[n]early one in ten college students said they were homeless in the last year, meaning they had at least one night where they didn't know where they were going to sleep." Homeless enumeration counts are mandated by HUD for all jurisdictions participating in HUD Continuum of Care grant programs. These occur as frequently as every two years. More recently, organizations such as Common Ground have compiled Vulnerability Indexes which prioritize homeless persons. The factors include the existence of late stage terminal disease, HIV-AIDS, kidney or liver disease, frequent hospitalizations and frequent emergency room visits. The data which is compiled which exceeds the BUD mandate is retained and held confidential by Common Ground. Advocates of the system claim high rates of success in placing the most vulnerable persons, but skeptics remain concerned with confidentiality and security issues. Since the late 1990s, housing policy has been a devolved matter, and state support for the homeless, together with legal rights in housing, have therefore diverged to a certain degree. A national service, called Streetlink, was established in 2012 to help members of the public obtain near-immediate assistance for specific rough sleepers, with the support of the Government (as housing is a devolved matter, the service currently only extends to England). Currently, the service does not operate on a statutory basis, and the involvement of local authorities is merely due to political pressure from the government and charities, with funding being provided by the government (and others) on an ad-hoc basis. The annual number of homeless households in England peaked in 2003–04 at 135,420 before falling to a low of 40,020 in 2009–10. In 2014–15, there were 54,430 homeless households, which was 60 per cent below the 2003–04 peak. The UK has more than 80,000 children in temporary accommodation, a number which increases every year. In 2007 the official figures for England were that an average of 498 people slept rough each night, with 248 of those in London. It is important to note that many individuals may spend only a few days or weeks sleeping rough, and so any number for rough sleepers on a given night hides the total number of people actually affected in any one year. Homelessness in England since 2010 has been rising. By 2016 it is estimated the numbers sleeping rough had more than doubled since 2010. The National Audit Office say in relation to homelessness in England 2010-17 there has been a 60% rise in households living in temporary accommodation and a rise of 134% in rough sleepers. It is estimated 4,751 people bedded down outside overnight in England in 2017, up 15% on previous year. The housing charity Shelter used data from four sets of official 2016 statistics and calculated 254,514 people in England were homeless. A homeless person collecting recyclable materials in Stellenbosch, South Africa. In South Africa, there are an estimated 200,000 homeless people from a diverse range of backgrounds. Most South African municipalities primarily view homelessness as a social dependency issue, responding with social interventions. In Sweden, municipalities are required to provide a home to any citizen who does not have one. However, landlords and lessors have the right to select guests among applicants. Owners, including municipalities themselves, avoid homeless people, unemployed people or people with a bad credit score. People who cannot pay their rent will be evicted, including families with small children. In 2009, 618 children were evicted. In cities with a lack of housing, the only options for homeless are usually shelters; usually privately owned, often of bad quality, for which municipalities pay. In Finland the municipalities are required by law to offer apartments or shelters to every Finnish citizen who does not have a residence. In 2007 the centre-right government of Matti Vanhanen began a special program of four wise men modeled after a US-originated Housing First policy to eliminate homelessness in Finland by 2015. After the abolition of serfdom in Russia in 1861, major cities experienced a large influx of former peasants who sought jobs as industrial workers in rapidly developing Russian industry. These people often lived in harsh conditions, sometimes renting a room shared between several families. There also was a large number of shelterless homeless. Immediately after the October Revolution a special program of "compression" ("уплотнение") was enabled: people who had no shelter were settled in flats of those who had large (4, 5 or 6 room) flats with only one room left to previous owners. The flat was declared state property. This led to a large number of shared flats where several families lived simultaneously. Nevertheless, the problem of complete homelessness was mostly solved as anybody could apply for a room or a place in dormitory (the number of shared flats steadily decreased after large-scale residential building program was implemented starting in the 1960s). By 1922 there were at least 7 million homeless children in Russia as a result of nearly a decade of devastation from World War I and the Russian Civil War. This led to the creation of a large number of orphanages. By the 1930s the USSR declared the abolition of homelessness and any citizen was obliged to have a propiska – a place of permanent residency. Nobody could be stripped of propiska without substitution or refuse it without a confirmed permission (called "order") to register in another place. If someone wanted to move to another city or expand their living area, he had to find a partner who wanted to mutually exchange the flats. The right for shelter was secured in the Soviet constitution. Not having permanent residency was legally considered a crime. After the breakup of the USSR, the problem of homelessness sharpened dramatically, partially because of the legal vacuum of the early 1990s with some laws contradicting each other and partially because of a high rate of frauds in the realty market. In 1991 articles 198 and 209 of Russian criminal code which instituted a criminal penalty for not having permanent residence were abolished. In Moscow, the first overnight shelter for homeless was opened in 1992. In the late 1990s, certain amendments in law were implemented to reduce the rise in homelessness, such as the prohibition of selling last flat with registered children. Nevertheless, the state is still obliged to give permanent shelter for free to anybody who needs better living conditions or has no permanent registration, because the right to shelter is still included in the constitution. Several projects of special cheap 'social' flats for those who failed to repay mortgages were proposed to facilitate mortgage market. According to the most recent count by the Puerto Rico Department of Family, in January 2017 there were 3,501 homeless persons in the territory. The study shows that 26.2% of this population live in the capital, San Juan. Other municipalities percentage of this population was Ponce with 6.3%, Arecibo with 6%, Caguas with 5.3%, and Mayagüez with 4.7%. Results from the study determined that 76% of the homeless population were men and 24% were women and that both men and women populations, were on average age, 40 years old. This steadily increasing population, might have increased more drastically as a result of Hurricane María which caused over 90 billion dollars in damage to the island of Puerto Rico. Data provided by the Department of Community Social Development of San Juan, indicates that in 1988 the number of homeless in the municipality was of 368, while in 2017 there are about 877 persons without a home. While the average age for the overall homeless population is 40 years old for both women and men, in San Juan the median is 48 years for men and 43 years for women. Other data obtained showed that more than 50% have university level education. Also it revealed that 35% of men and 25% of women have relapsed more than four times after unsuccessful attempts to reinsert themselves socially. Reasons given to wander are varied with the most common causes being drug abuse (30.6%), family problems (22.4%), financial or economic problems (15.0%), and others such as unemployment, mental health problems, domestic violence, evictions, or lack of support when released from prison. There are estimated to be 15,000 homeless persons in Hungary of which about 6,500 live in Budapest (2016). There have been repeated attempts at criminalising homelessness in Hungary by the Fidesz government and homeless people face severe restrictions in many cities. 131 homeless people died of cold exposure in Budapest between 2006 and 2010. Homelessness in popular culture is depicted in various works. The issue is frequently described as an invisible problem, despite its prevalence. Writers and other artists play a role in bringing the issue to public attention. Homelessness is the central theme of many works; in other works homelessness is secondary, added to create interesting characters or contribute authenticity to the setting (e.g., for a story set in the impoverished inner city). Some stories and films depict homeless people in a stereotypical or pejorative manner (e.g., the exploitation film Hobo With a Shotgun, which depicts homeless people fighting). Modern Times, 1936 film, shows negative effects of vagrancy laws. Cathy Come Home, 1966, shows the effects of homelessness on parenthood. God Bless the Child, 1988, is a made-for-TV movie about a single mother (Mare Winningham) living on the streets of New York City with her young daughter. Dark Days, 2000, 81 minutes, is a documentary by Marc Singer, who followed the lives of people living in the Freedom Tunnel, an Amtrak tunnel in New York City. Homeless to Harvard: The Liz Murray Story, 2003 film about a homeless girl, Liz Murray, who works her way up to admission to Harvard University. Advocates for the homeless have developed various events, commemorations, and projects to raise awareness of the issue of homelessness. In 1987, the United Nations established an International Year of Shelter for the Homeless. In England, advocates founded an annual event named Homelessness Action Week.In Australia, NGOs have founded two main annual events: Homeless Persons' Week, and Youth Homelessness Matters Day. Some advocates have taken to social media to raise awareness with projects such as I Have A Name. ^ a b Hanson-Easey, Scott; Every, Danielle; Tehan, Bridget; Richardson, John; Krackowizer, Antoinette (2016). "Climate change, housing and homelessness: Report on the homelessness and climate change forum" (PDF). ^ "Glossary defining homelessness". Retrieved 17 September 2014. ^ Office of Applied Studies, United States Department of Health and Human Services, "Terminology"
^ "United States Code, Title 42, Chapter 119, Subchapter I, § 11302". Retrieved 17 September 2014. ^ "A roof is not enough – a look at homelessness worldwide, by Monte Leach, Share International Archives". Share-international.org. Retrieved 7 December 2017. ^ "Global Homelessness Statistics – Homeless World Cup". Homelessworldcup.org. Retrieved 7 December 2017. ^ "Homelessness around the world". Boston.com. 14 December 2011. ^ Hurst, Charles E. (1 January 1998). Social Inequality: Forms, Causes, and Consequences. Allyn and Bacon. ISBN 9780205264841 – via Google Books. ^ Netherlands, Statistics. "17 homeless in every 10 thousand Dutch". www.cbs.nl. ^ Roleff, Tamara L (1996). The Homeless: Opposing Viewpoints – Google Books. ISBN 9781565103603. Retrieved 17 September 2014. ^ "Race, Gender and Homelessness". Gender Policy Report. 18 April 2018. Retrieved 19 June 2018. ^ OECD Affordable Housing Database (2017). "HC3.1 HOMELESS POPULATION" (PDF). ^ Fazel, S; Khosla, V; Doll, H; Geddes, J (2008). "The Prevalence of Mental Disorders among the Homeless in Western Countries: Systematic Review and Meta-Regression Analysis". PLOS Medicine. 5 (12): e225. doi:10.1371/journal.pmed.0050225. PMC 2592351. ^ Shelton, Katherine; Taylor, Pamela; Bonner, Adrian; van den Bree, Marianne (2009). "Risk Factors for Homelessness: Evidence From a Population-Based Study". Psychiatric Services. 60 (4): 465–472. doi:10.1176/ps.2009.60.4.465. ^ Molnar, B; Shade, S; Kral, A; et al. (1998). "Suicidal behaviour and sexual/physical abuse among street youth". Child Abuse and Neglect. 25: 137–148. ^ Claire Scott (5 July 2016). "Kinahan gang taking advantage of homeless crisis as part of latest fraud scheme". Dublin Live. Retrieved 17 October 2017. ^ Kristin Rodine (5 May 2017). "Georgia man gets 10 months for perpetrating 'Operation Homeless' fraud in Boise". Idaho Statesman. Retrieved 17 October 2017. ^ Kevin Wendolowski (2014). "Fighting fraudsters who target homeless in scams". Fraud Magazine (September–October). Retrieved 17 October 2017. ^ Nicholas Confessore (24 November 2009). "Homeless Organization Is Called a Fraud". The New York Times. Retrieved 17 October 2017. ^ David Barnett (31 October 2016). "Is Begging Just A Scam, Or A Lifeline For Those Most In Need?". The Independent. Retrieved 17 October 2017. ^ "Article 25". Retrieved 17 September 2014. ^ "ETHOS Typology of Homelessness and Housing Exclusion". Retrieved 11 February 2017. ^ Amore, Kate, Michael Baker and Philippa Howden-Chapman. "The ETHOS Definition and Classification of Homelessness: An Analysis" (PDF). The European Journal of Homelessness, Volume 5.2, December 2011. FEANTSA. Archived from the original (PDF) on 31 January 2012. Retrieved 31 July 2012. ^ "Inside Straight Edge". Writer: David Shadrack Smith. Directors: Jim Gaffey and David Shadrack Smith. Inside. National Geographic Society. 9 April 2008. Retrieved on 28 January 2011. ^ Svitek, Patrick. "Evanston homeless find warm shelters". Daily Northwestern. Archived from the original on 23 March 2011. Retrieved 14 February 2011. ^ "Breaking Ground: Building and Restoring Lives". Breaking Ground, LLC. Renamed from "Common Ground" (previous ref): "Common Ground is now Breaking Ground". 23 October 2015. Retrieved 24 May 2017. We are pleased to share with you that as of October 23, 2015, Common Ground has changed its name to Breaking Ground. 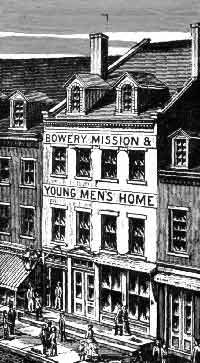 ^ "New York City Rescue Mission website". Retrieved 17 September 2014. ^ "Riding the Rails". Retrieved 17 September 2014. ^ Scherl DJ, Macht LB (September 1979). "Deinstitutionalization in the absence of consensus". Hosp Community Psychiatry. 30 (9): 599–604. doi:10.1176/ps.30.9.599. PMID 223959. Archived from the original on 6 January 2012. ^ Seth Farber, "Homelessness, Madness, the Power Elites and Final Battles of the East Village," in Clayton Patterson, ed., Resistance: A Radical Social and Political History of the Lower East Side (2007). ^ Rochefort DA (1984). "Origins of the "Third psychiatric revolution": the Community Mental Health Centers Act of 1963". J Health Polit Policy Law. 9 (1): 1–30. doi:10.1215/03616878-9-1-1. PMID 6736594. Archived from the original on 9 July 2012. ^ Borus JF (August 1981). "Sounding Board. De-institutionalization of the chronically mentally ill". N. Engl. J. Med. 305 (6): 339–342. doi:10.1056/NEJM198108063050609. PMID 7242636. ^ "FACS, "Homeless Children, Poverty, Faith and Community: Understanding and Reporting the Local Story", March 26, 2002 Akron, Ohio". Archived from the original on 28 September 2007. ^ "Schreiber Cindy, "Sandwich men bring in the bread and butter", Columbia (University) News Service, May 8, 2002". Jrn.columbia.edu. Archived from the original on 26 June 2007. Retrieved 7 December 2017. ^ "Victorian London site, "Sandwich Men"". Retrieved 17 September 2014. ^ Abel, David, "For the homeless, keys to a home: Large-scale effort to keep many off street faces hurdles", Boston Globe, 24 February 2008. ^ PBS, "Home at Last? – A radical new approach to helping the homeless", NOW TV program, 21 December 2007. ^ Solutions at Work, "Formerly Homeless Boston Man Donates Significant Portion of Social Security Retro-Check to the Organizations and People Who Gave Him a 'Hand Up'" Archived 17 May 2008 at the Wayback Machine, 2002. ^ "Homeless children at record high in US. Can the trend be reversed?". The Christian Science Monitor. 13 December 2011. Retrieved 17 September 2014. ^ a b "State of the Homeless 2012". Retrieved 17 September 2014. ^ "600 homeless children in D.C., and no one seems to care". Washington Post. Archived from the original on 28 July 2013. Retrieved 17 September 2014. ^ National Alliance to End Homelessness, "Rapid Re-Housing", 8 July 2008. ^ "The HEARTH Act – An Overview" Archived 8 October 2010 at the Wayback Machine, National Law Center on Homelessness and Poverty, Washington, D.C.
^ a b "Hunger and Homelessness Survey: A Status Report on Hunger and Homelessness in America's Cities: A 27-City Survey December 2009" (PDF). United States Conference of Mayors. December 2009. Archived from the original (PDF) on 10 January 2010. ^ a b Cf. Levinson, Encyclopedia of Homelessness, article entry on Causes of Homelessness: Overview by Paul Koegel, pp.50–58. ^ "Homes Not Handcuffs: The Criminalization of Homelessness in U.S. Cities" (PDF). Nationalhomeless.org. July 2009. Retrieved 7 December 2017. ^ "Homeless and Runaway Youth". ^ Shinn, Marybeth; et al. (2007). "Predictors of homelessness among older adults in New York City: Disability, economic, human and social capital and stressful events". Journal of Health Psychology. 12 (5): 696–708. CiteSeerX 10.1.1.929.4845. doi:10.1177/1359105307080581. PMID 17855456. ^ a b Segal S. P.; Baumohl J. (1980). "Engaging the disengaged: Proposals on madness and vagrancy". Social Work. 25 (5): 358–365. JSTOR 23713231. ^ Connolly, Adrian J. (2008). "Personality disorders in homeless drop-in center clients" (PDF). Journal of Personality Disorders. 22 (6): 573–588. doi:10.1521/pedi.2008.22.6.573. PMID 19072678. Archived from the original (PDF) on 17 June 2009. Retrieved 31 January 2017. With regard to Axis II, Cluster A personality disorders (paranoid, schizoid, schizotypal) were found in almost all participants (92% had at least one diagnosis), and Cluster B (83% had at least one of antisocial, borderline, histrionic, or narcissistic) and C (68% had at least one of avoidant, dependent, obsessive-compulsive) disorders also were highly prevalent. ^ An example is the 1999 Athens earthquake in Greece in which many middle class people became homeless, with some of them living in containers, especially in the Nea Ionia earthquake survivors container city provided by the government; in most cases their only property that survived the quake was their car. Such people are known in Greece as seismopathis, meaning earthquake-struck. ^ Stephen W. Hwang MD MPH (2008). "The effect of traumatic brain injury on the health of homeless people". Canadian Medical Association Journal. 179 (8): 779–784. doi:10.1503/cmaj.080341. PMC 2553875. PMID 18838453. ^ Coalition on Homelessness and Housing in Ohio (17 September 2006). 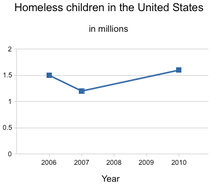 Homelessness: The Causes and Facts Archived 18 June 2006 at the Wayback Machine. Retrieved 10 May 2006. ^ For example, cf. "News Release: Personal Income for Metropolitan Areas, 2006", Bureau of Economic Analysis. ^ Amster, Randall (2008). Lost in Space: The Criminalization, Globalization, and Urban Ecology of Homelessness. New York: LFB Scholarly. ISBN 978-1-59332-297-7. OCLC 221150739. ^ Dromi, Shai M. (1 December 2012). "Penny for Your Thoughts: Beggars and the Exercise of Morality in Daily Life". Sociological Forum. 27 (4): 847–871. doi:10.1111/j.1573-7861.2012.01359.x. ^ Thomas W. Sulcer, 10 September 2015, Westfield TAPinto, Westfield Mom Rallies Community to Turn Homeless Man’s Life Around in a Month, Retrieved 11 September 2015, "..During one attack, all of his contact information was taken from him ... lost the phone number and address of his daughter... as well as important identifying documents....."
^ Lewan, Todd, "Unprovoked Beatings of Homeless Soaring", Associated Press, 8 April 2007. ^ National Coalition for the Homeless, Hate, "Violence, and Death on Main Street USA: A report on Hate Crimes and Violence Against People Experiencing Homelessness, 2008", August 2009. ^ "Judge gives Alex Rios maximum sentence for homeless men killing". KRQE News 13. 25 February 2016. ^ "Teen charged with killing homeless men sentenced". KRQE News 13. 4 October 2016. ^ Grimes, Paul (January 1997). "Assessing the Effect of Rent Control on Homelessness". Journal of Urban Economics. 41: 23–37. doi:10.1006/juec.1996.1085. ^ Pascale, Celine-Marie (1 May 2005). "There's No Place Like Home: The Discursive Creation of Homelessness". Cultural Studies ↔ Critical Methodologies. 5 (2): 250–268. doi:10.1177/1532708605274558. ^ Rosenheck, Robert (December 1994). "Homelessness in America". American Journal of Public Health. 84 (12): 1885–1886. doi:10.2105/ajph.84.12.1885. ^ Knecht, Tom; Martinez, Lisa M. (2009). "Humanizing the homeless: Does contact erode stereotypes?". Social Science Research. 38 (3): 521–534. doi:10.1016/j.ssresearch.2009.01.009. ^ Magallanes-Blanco, Claudia; Pérez-Bermúdez, Juan Antonio (2009). "Citizens' Publications That Empower: Social Change for the Homeless". Development in Practice. 19 (4/5): 654–664. doi:10.1080/09614520902866306. JSTOR 27752103. ^ Schoeni, Robert F.; Koegel, Paul (1998). "Economic Resources of the Homeless: Evidence from Los Angeles". Contemporary Economic Policy. 16 (3): 295–308. doi:10.1111/j.1465-7287.1998.tb00520.x. ^ "SOAR – SSI/SSDI Outreach, Access and Recovery for people who are homeless". Retrieved 17 September 2014. ^ Snow, David A.; Anderson, Leon (1993). Down on their Luck: A Study of Homeless Street People. Berkeley: University of California Press. ISBN 978-0-520-07989-2. ^ "Comprehensive, Shelter-Based Clinic Enhances Access to Oral Health Services for Homeless in Los Angeles". Agency for Healthcare Research and Quality. 27 March 2013. Retrieved 10 May 2013. ^ "Many waste pickers reported as homeless". 20 June 2012. Retrieved 17 September 2014. ^ "Homeless people collecting litter". Gov You. Retrieved 17 September 2014. ^ "Web Entrepreneur Banks on 'Bum-vertising'". ABC News. 6 January 2006. ^ Abel, David, "Panhandlers move from street to Internet: Online sites offer a fertile venue for some in need", Boston Globe, 26 October 2009. ^ a b c d e "United States Interagency Council on Homelessness". 2013. Archived from the original on 19 March 2014. Retrieved 25 February 2014. ^ "United States Interagency Council on Homelessness". 2013. Retrieved 25 February 2014. ^ a b "United States Department of Labor". Find It! By Audience-Homeless & Service Providers to the Homeless. 2014. Retrieved 25 February 2014. ^ "The Big Issue". Big Issue. Retrieved 17 September 2014. ^ "Street Sense website". Retrieved 17 September 2014. ^ "The Challenger Street Newspaper – Ending Homelessness – Austin TX". www.challengernewspaper.org. ^ "Homeward". Retrieved 28 September 2017. ^ "Homeward Street Journal Serves Sacramento's Homeless". 18 June 2015. Retrieved 28 September 2017. ^ Hall, Corey. "Living Solutions". Archived from the original on 19 March 2014. Retrieved 22 February 2014. ^ "English". HSandudvalg.dk. Retrieved 7 December 2017. ^ a b c Anker, J. (1 February 2008). "Organizing homeless people: Exploring the emergence of a user organization in Denmark". Critical Social Policy. 28 (1): 27–50. doi:10.1177/0261018307085506. ^ Smith, Doug (16 February 2019). "Five winning ideas to build housing more quickly and cheaply for L.A.'s homeless community". www.latimes.com. Los Angeles Times. Retrieved 15 February 2019. ^ Matthew, Zoie (18 May 2018). "Here's How You Turn Shipping Containers Into Housing for the Homeless". www.lamag.com. LA Magazine. Retrieved 18 May 2018. ^ "You Don't Need a Home to Vote". National Coalition for the Homeless. Retrieved 22 February 2014. ^ "Voting Rights: Registration Manual : You Don't Need a Home to Vote" (PDF). Nationalhomeless.org. August 2012. Retrieved 7 December 2017. ^ Nunez, Ralph, "Family Homelessness in New York City: A Case Study", Political Science Quarterly, Vol. 116, No. 3 (Autumn, 2001), pp. 367–379, The Academy of Political Science. ^ Centers for Disease Control, "Prevention and Control of Tuberculosis Among Homeless Persons : Recommendations of the Advisory Council for the Elimination of Tuberculosis", 17 April 1992 / 41(RR-5);001. ^ Slutkin G. Management of tuberculosis in urban homeless indigents. Public Health Rep 1986;101(5):481–485. 17. ^ McAdam J, Brickner PW, Glicksman R, Edwards D, Fallon B, Yanowitch P. Tuberculosis in the SRO/homeless population. In: Brickner PW, Scharer LK, Conanan B, Elvy A, Savarese M, eds. Health care of homeless people. New York: Springer, 1985:155–175. 18. ^ Justin McCurry (28 September 2007). "Tokyo dreaming". The Guardian. ^ Lam, Evangeline (13 January 2016). "The lives of others: where Hong Kong's wealth abandons those without shelter". South China Morning Post. Retrieved 15 April 2017. ^ a b "How We Survive: The Deepening Homeless Crisis". Making Contact Radio: Media that helps build movements. 18 February 2009. Retrieved 17 September 2014. ^ Paul Sims (11 September 2007). "The couple who stopped off at a Travelodge – and stayed 22 years". Retrieved 8 January 2008. ^ Kleinig, John (October 1993). "Policing the Homeless: an ethical dilemma". Journal of Social Distress and the Homeless. 2 (4): 289–303. doi:10.1007/BF01065524. ^ Brandt, David E. (October 1993). "Social Distress and the police". Journal of Social Distress and the Homeless. 2 (4): 305–313. doi:10.1007/BF01065525. ^ "Definition of Residential hotel/single room occupancy". Law Insider. Retrieved 21 December 2018. ^ Cite error: The named reference ccroc was invoked but never defined (see the help page). ^ Brenoff, Ann (3 May 2014). "7 Myths About Homeless People Debunked". Huffington Post. Retrieved 4 May 2014. ^ Dordick, Gwendolyn A., "Recovering from Homelessness: Determining the 'Quality of Sobriety' in a Transitional Housing Program", Journal Qualitative Sociology, Volume 25, Number 1 / March 2002, Springer Netherlands. ^ "Common Ground". Retrieved 17 September 2014. ^ "Cost of homelessness in Central Florida? $31K per person". The Orlando Sentinel. 21 May 2014. ^ "Leaving Homeless Person On The Streets: $31,065. Giving Them Housing: $10,051". ThinkProgress. 27 May 2014. Karaca, Zeynal; Wong, Herbert; Mutter, Ryan; Characteristics of Homeless and Non-Homeless Individuals Using Inpatient and Emergency Department Services, 2008. Statistical Brief #152. March 2013. Agency for Healthcare Research and Quality. Aday, Lu Ann Archived 27 September 2007 at the Wayback Machine, "Health status of vulnerable populations", Annual Review of Public Health, 1994;15:487–509. United States Department of Health and Human Services, "Healthcare for the Homeless". Ferguson, M., "Shelter for the Homeless", American Journal of Nursing, 1989, pp.1061–1062. Lenehan, G., McInnis, B., O'Donnell, and M. Hennessey, "A Nurses' Clinic for the Homeless", American Journal of Nursing, 1985, pp.1237–1240. Martin-Ashley, J., "In Celebration of Thirty Years of Caring: Pine Street Inn Nurses Clinic", Unpublished. Lee, Tony, "City launches homeless healthcare facility", Boston Metro, 29 May 2008. Gelberg L, Gallagher TC, Andersen RM, Koegel P (February 1997). "Competing priorities as a barrier to medical care among homeless adults in Los Angeles". Am J Public Health. 87 (2): 217–220. doi:10.2105/AJPH.87.2.217. PMC 1380797. PMID 9103100. ^ Tsai, Jack; Rosenheck, Robert A. (2013). "Obesity among chronically homeless adults: Is it a problem?". Public Health Reports. 128 (1): 29–36. doi:10.1177/003335491312800105. PMC 3514718. PMID 23277657. ^ "Health Care and Homelessness". Retrieved 17 September 2014. ^ National Law Center on Homelessness and Poverty, "Photo Identification Barriers Faced by Homeless Persons". ^ Moore, Grace Elizabeth. "No Angels Here: The Closing of the Pine Street Inn Nurses Clinic, 1972–2003" (PDF). Center for the Study of World Religions, Harvard Divinity School. Archived from the original (PDF) on 25 May 2011. ^ Beth Haysom (December 2007). "Caring for the footweary homeless". The Ring: The University of Victoria's community newspaper. Archived from the original on 30 January 2009. Many of the homeless suffer from "street feet", which, Bell explains, are really sore feet, blistered and damaged from walking around all day with no means to change socks and shoes or care for their feet. ^ Dentistry, University of Hong Kong Faculty of (2005). "An oral health survey of homeless people in Hong Kong (2005) – University of Hong Kong Libraries, Digital Initiatives, Community Health Project". Lookup.lib.hku.hk. Retrieved 7 December 2017. ^ Joslyn, Matthew I., M.D., et al., "Adapting Your Practice: Treatment and Recommendations for Homeless Patients with Diabetes Mellitus" Archived 26 November 2010 at the Wayback Machine, June 2007, HCH Clinicians' Network. ^ O'Connell, James, J; et al., eds. (2004). "The Health Care of Homeless Persons: a Manual of Communicable Diseases & Common Problems in Shelters & On the Streets", Boston Health Care for the Homeless Program". ^ Watson, Dennis P.; George, Christine; Walker, Christopher, "Falling through the cracks: health care needs of the older homeless population and their implications", in Kronenfeld, Jennie Jacobs, Care for Major Health Problems and Population Health Concerns: Impacts on Patients, Providers and Policy, Research in the Sociology of Health Care series, 2008, v.26, pp.187–204, Emerald Group Publishing Limited. ^ Cohen Carl I (1999). "Aging and Homelessness". The Gerontologist. 39 (1): 5–15. doi:10.1093/geront/39.1.5. PMID 10028766. ^ "Boston's Elderly Homeless Sicker Than Others, Research Finds". ScienceDaily. Retrieved 17 September 2014. ^ "Homelessness Resources on the Web – National Health Care for the Homeless Council". National Health Care for the Homeless Council. 26 October 2011. Retrieved 17 September 2014. ^ "Health Center Data". Retrieved 17 September 2014. ^ Tsai, Jack; Rosenheck, Robert A.; Culhane, Dennis; Artiga, Samantha (September 2013). "Medicaid expansion: Chronically homeless adults will need targeted enrollment and access to a broad range of services". Health Affairs. 32 (9): 1552–1559. doi:10.1377/hlthaff.2013.0228. PMID 24019359. ^ "Detroit cuts funding for homeless warming centers". wsws.org. 29 January 2011. ^ Hendricks, Mike (2011). "After judge's warning, homeless camp with TV, Christmas lights is taken apart". The Kansas City Star. Retrieved 14 February 2011. ^ Memar, Omeed (Fall 2018). "Review of Dermatological Problems among the Homeless". ARC Journal of Dermatology. 3: 1–6. doi:10.20431/2456-0022.0303005 (inactive 8 March 2019). ^ Barrow SM, Herman DB, Córdova P, Struening EL (April 1999). "Mortality among homeless shelter residents in New York City". Am J Public Health. 89 (4): 529–534. doi:10.2105/AJPH.89.4.529. PMC 1508869. PMID 10191796. ^ "Homeless people die 30 years younger, study suggests". BBC News. 21 December 2011. Retrieved 17 September 2014. ^ McMichael, T; Montgomery, H; Costello, A (2012). "Health risks from climate change". British Medical Journal. 344 (7849): 26–29. ^ a b c d e Ramin, B; Svoboda, T (2009). "Health of the Homeless and Climate Change". Journal of Urban Health. 86 (4): 654–664. ^ a b c d Cusak, L; van Loon, A; Kralik, D; Arbon, P; Gilbert, S (2013). "Extreme-weather related health needs of people who are homeless". Australian Journal of Primary Health. 19: 250–255. ^ Madhumathi, A; Subhashini, S; Vishnupriya, J (2017). "The urban heat island effect, its causes, and mitigation, with reference to the thermal properties of roof coverings". Journal of Environmental Management. 197: 522–538. ^ a b Pendrey, CG; Carey, M; Stanley, J (2014). "Impacts of extreme weather on the health and well-being of people who are homeless". Australian Journal of Primary Health. 20 (1): 2–3. ^ Bouchama, A; Dehbi, M; Mohammed, G; Matthies, F; Shoukri, M; Menne, B (2007). "Prognostive factors in heat-wave related deaths: a meta-analysis". Arch Intern Med. 167 (20): 2170–2176. ^ Roleff, Tamara L. (1 January 1996). The Homeless: Opposing Viewpoints. Greenhaven Press. ISBN 9781565103603 – via Google Books. ^ Cortese, Anthony J. (1 January 2003). Walls and Bridges: Social Justice and Public Policy. SUNY Press. ISBN 9780791459072 – via Google Books. ^ Capdevila, Gustavo, "Human Rights: More Than 100 Million Homeless Worldwide" Archived 22 April 2009 at the Wayback Machine, IPS, Geneva. ^ Laird, Gordon (2007). "Shelter-Homelessness in a growth economy: Canada's 21st century paradox. – A Report for the Sheldon Chumir Foundation for Ethics in Leadership" (PDF). Archived from the original (PDF) on 6 January 2016. ^ "Australian Bureau of Statistics, Media Release "Homelessness in Australia"". 4 September 2008. Retrieved 17 September 2014. ^ "HUD 2010 Annual Homeless Assessment Report to Congress". Archived from the original on 13 September 2014. Retrieved 17 September 2014. ^ Roman, Nan, "Tracking the Homeless: An Overview of HMIS" Archived 13 September 2007 at the Wayback Machine, ShelterForce Magazine, Issue #132, November/December 2003, National Housing Institute. ^ "HUD information on HMIS". Hud.gov. Archived from the original on 25 September 2006. Retrieved 7 December 2017. ^ Perl, Libby, "The Home Management Information System", Congressional Research Service, CRS Report RS22328, November 2005. ^ "EPIC page on HMIS privacy". Retrieved 17 September 2014. ^ Freeman Richard B.; Hall Brian (1987). "Permanent Homelessness in America?". Population Research and Policy Review. 6: 3–27. doi:10.1007/bf00124800. ^ a b "Los Angeles County Homelessness Fact Sheet #1 Number of Homeless People Nightly" (PDF). Shelterpartnership.org. Archived from the original (PDF) on 25 March 2009. Retrieved 7 December 2017. ^ "Emergency Shelter Commission, City of Boston". Retrieved 17 September 2014. ^ "Annual Homeless Census. City of Boston". Archived from the original on 5 November 2011. Retrieved 17 September 2014. ^ "LAHSA – Los Angeles Homeless Services Authority". Lahsa.org. Retrieved 7 December 2017. ^ Martin, Melissa, "One, Two... 664,414: Calculating Homelessness in America" Archived 2 June 2010 at the Wayback Machine, US SAMHSA, Homelessness Resource Center. ^ ""In pictures: Japan's homeless", BBC News". Retrieved 17 September 2014. ^ "Asia: The Big Issue Japan". Archived from the original on 6 July 2010. Retrieved 17 September 2014. ^ Capdevila, Gustavo, "Human Rights: More Than 100 Million Homeless Worldwide" Archived 22 April 2009 at the Wayback Machine, IPS (Inter Press Service), 30 March 2005. ^ UN-HABITAT, "The Challenge of Slums – UN-HABITAT's new Global Report on Human Settlements" Archived 21 December 2008 at the Wayback Machine, 10 January 2003. ^ YXC Project, UNEP/UNESCO, "Homeless: Developing Countries". "Homelessness has also become a problem in the cities of China, Thailand, Indonesia, and the Philippines despite their growing prosperity, mainly due to migrant workers who have trouble finding permanent homes and to rising income inequality between social classes." ^ Tipple, Graham; Speak, Suzanne (2005). "Definitions of Homelessness in Developing Countries". Habitat International. 29 (2): 337–52. doi:10.1016/j.habitatint.2003.11.002. ^ Kassam, A., & Nanji, A. (2006). Mental health of Afghan refugees in Pakistan: A qualitative rapid reconnaissance field study. Intervention, 4, 58–66. ^ Springer, Sabine (2000). "Homelessness: A Proposal for a Global Definition and Classification". Habitat International. 24 (4): 475–84. doi:10.1016/s0197-3975(00)00010-2. ^ Moore, Jeanne (2007). "Polarity or Integration? Towards a Fuller Understanding of Home and Homelessness". Journal of Architectural and Planning Research. 24 (2): 143–59. ^ Saunders, Peter. A Nation of Home Owners. London: Unwin Hyman, 1990. Print. ^ Casavant, Lyne. "Definition of Homelessness." Definition of Homelessness (PRB99-1E). Parliamentary Research Branch, Jan. 1999. Web. 19 September 2013. ^ Meghan, Morris D.; Popper, Steve T.; Rodwell, Timothy C.; Brodine, Stephanie K.; Brouwer, Kimberly C. (2009). "Healthcare Barriers of Refugees Post-resettlement". Journal of Community Health. 34 (6): 529–38. doi:10.1007/s10900-009-9175-3. PMC 2778771. PMID 19705264. ^ Osborn A (June 2005). "Russia's youth faces worst crisis of homelessness and substance misuse since second world war". BMJ. 330 (7504): 1348. doi:10.1136/bmj.330.7504.1348-b. PMC 558316. PMID 15947386. ^ United Nations, "United Nations: Global Report on Human Settlements"
^ "Demand for SAAP assistance by homeless people 2003–04 (AIHW)". Aihw.gov.au. Archived from the original on 26 April 2010. Retrieved 7 December 2017. ^ "Supported Accommodation Assistance Program (SAAP) (AIHW)". Aihw.gov.au. Archived from the original on 19 September 2016. Retrieved 13 September 2016. ^ Joint Hearing op. cit., May 1984, p. 32 IUD Office for Policy Development and Research, A Report to the Secretary on the Homeless and Emergency Shelters, 1 May 1986. ^ Graves, Florence; Sayfan, Hadar, "First things first: 'Housing first,' a radical new approach to ending chronic homelessness, is gaining ground in Boston", Boston Globe, Sunday, 24 June 2007. ^ Roncarati, Jill, "Homeless, housed, and homeless again" Archived 30 December 2008 at the Wayback Machine, Journal of the American Academy of Physician's Assistants, June 2008. ^ "Community Partnership for Homeless". Chapman Partnership. Retrieved 17 September 2014. ^ "Carrfour Supportive Housing". Retrieved 17 September 2014. ^ Seward, Zack. "Making a run for it: How Philly's Back on My Feet went national" (PDF). NewsWorks. WHYY. Archived from the original (PDF) on 21 May 2013. Retrieved 11 March 2013. ^ "Mission & Process". backonmyfeet.org. Back on My Feet. Retrieved 11 March 2013. ^ St. Martin, Greg, "Seeking help for homeless on Common: Program hopes to offer housing", Boston Metro newspaper, Monday, 17 September 2007. ^ "Massachusetts Medical Society and Alliance Charitable Foundation website". Retrieved 17 September 2014. ^ Mayor's Office, City of Boston, "Mayor Menino Dedicates New Day Center for the Homeless", Press Release, 14 October 2009. ^ "NYC Homeless Counts". Retrieved 17 September 2014. ^ "Video Installation Encourages Homeless Activism In New York City". The Huffington Post. 9 March 2010. Retrieved 17 September 2014. ^ Affairs., Department of Veterans. "Homeless Veterans - Core Concepts". www.va.gov. ^ "Initiative Aims to End Homelessness for Veteran Families". fatherhoodchannel.com. 4 August 2011. ^ January 20, CBS News; 2019; Am, 9:10. "Homelessness on campus". www.cbsnews.com. Retrieved 20 March 2019. ^ "More than 80,000 children homeless for Christmas". BBC UK. 4 November 2013. Retrieved 22 July 2015. ^ "80,000 children facing homelessness this Christmas". Shelter England. Retrieved 22 July 2015. ^ McVeigh, Tracy (4 December 2016). "Growing crisis on UK streets as rough sleeper numbers soar". The Guardian. Retrieved 9 February 2018. ^ "Rough sleeping in England: autumn 2017 - GOV.UK". www.gov.uk. Retrieved 9 February 2018. ^ "Homeless rise 'driven by welfare reforms'". BBC News. 13 September 2017. Retrieved 9 February 2018. ^ Butler, Patrick (25 January 2018). "Rough sleeper numbers in England rise for seventh year running". The Guardian. Retrieved 9 February 2018. ^ Richardson, Hannah (1 December 2016). "'Quarter of a million homeless' in England". BBC News. Retrieved 9 February 2018. ^ "No one turned away". Newcastle residential areas. 16 April 2017. Retrieved 9 February 2018. ^ "Homelessness in South Africa". wp.wpi.edu. Retrieved 19 November 2016. ^ "Färre barn vräktes i fjol". Dn.se. Retrieved 7 December 2017. ^ "Reducing homelessness". Ymparisto.fi. Archived from the original on 4 February 2012. Retrieved 7 December 2017. ^ "And Now My Soul Is Hardened: Abandoned Children in Soviet Russia, 1918–1930". Retrieved 17 September 2014. ^ "Бездомность вчера, сегодня... Завтра?". Kulac.narod.ru. Retrieved 7 December 2017. ^ "Höjdestrand, Tova: The Soviet-Russian production of homelessness: propiska, housing, privatisation". Anthrobase.com. Retrieved 7 December 2017. ^ Figueroa-Rosa, Bárbara (5 August 2018). "Una realidad social que hay que atender". PrimeraHora (in Spanish). Retrieved 6 August 2018. ^ Figueroa-Rosa, Bárbara (8 August 2018). "Estrenan unidad móvil para personas sin techo en San Juan". PrimeraHora (in Spanish). Retrieved 10 August 2018. ^ "Thousands of Hungarian Homeless Remain on the Street as Winter Arrives - Hungary Today". Hungary Today. Retrieved 28 February 2018. ^ "Hungary: Outstanding Human Rights Concerns". Human Rights Watch. 18 February 2015. Retrieved 28 February 2018. ^ "How to help the homeless". The Economist. 7 December 2013. Retrieved 28 February 2018. Anderberg, Kristen (2011). 21st Century Essays on Homelessness. Seaward Avenue Press. ISBN 978-1-4565-3236-9. Crosette, Barbara, "Homeless and Hungry Youths of India", The New York Times, 23 December 1990. Friedman, Donna H., et al., "Preventing Homelessness and Promoting Housing Stability: A Comparative Analysis", The Boston Foundation, June 2007. Howard, Ella (2013). Homeless: Poverty and Place in Urban America. Philadelphia: University of Pennsylvania Press. ISBN 978-0-8122-4472-4. Journal of Social Distress and the Homeless, Springer Verlag and Psycke-Logos Press. Massachusetts Coalition for the Homeless, "Down & Out: A Manual on Basic Rights and Benefits for Homeless People", 2005–2006 edition, first published in 1984, 15 Bubier Street, Lynn, Massachusetts. Putnam, Kristen M., "Homelessness: Key Findings and Grantmaking Strategies", June 2002, Charles and Helen Schwab Foundation and Putnam Community Investment Consulting. Wright, James D. (1989). Address Unknown: The Homeless in America (Third ed.). New York: Transaction Publishers. ISBN 978-0-202-36409-4. Homeless Statistics for Australia, Canada, United Kingdom and the United States, all data from around the year 2001. PBS, "Home at Last? ", NOW series program, first aired on 2 February 2007. The topic was what will most help homeless people reenter the fabric of society. Homelessness in Europe FEANTSA is the European Federation of National Organisations Working with the Homeless is an umbrella of not-for-profit organizations which participate in or contribute to the fight against homelessness in Europe.